The day before the rest day saw a lot of action in London. 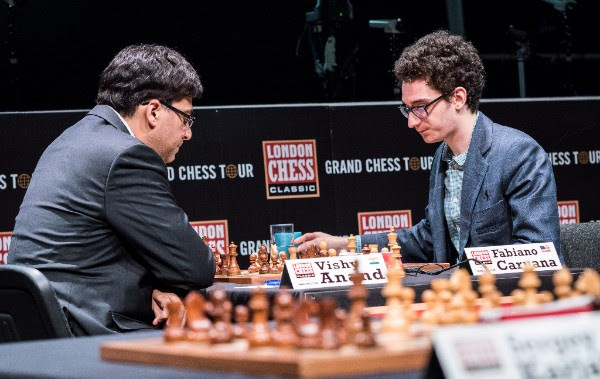 Once again, only Fabiano Caruana emerged victorious and extended his lead to a full point. 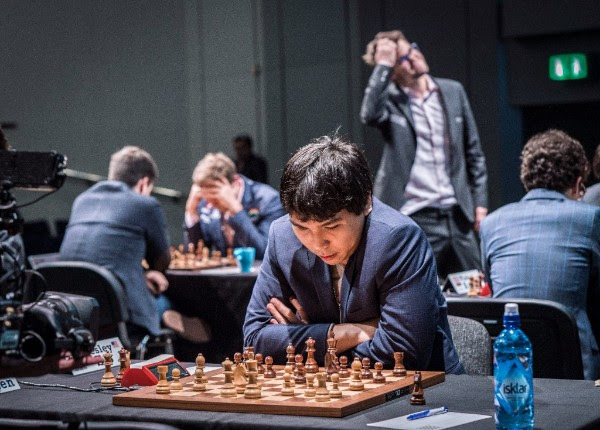 Magnus Carlsen’s five-and-a-half-hour struggle against Wesley So did not yield the result he was looking for, giving Caruana a full point lead over the rest of the field. Vachier-Lagrave was the only other player who had significant winning chances, but he did not handle the complications in his game well. Tomorrow is a rest day which will give the players an opportunity to fully recover from the first half of the event and enter the second half in a new mindset. This was an extremely complicated Spanish game with the kings castled on opposite sides. The position was unclear and could have gone either way as both sides were building their attacks with pawn storms. Caruana felt that his position was worse at one point but started to feel more comfortable when he found a clear idea of how to continue. At the critical moment, Anand blundered and did not enter the endgame because he thought he would get checkmated. The alternative choice favored Caruana whose attack became unstoppable. 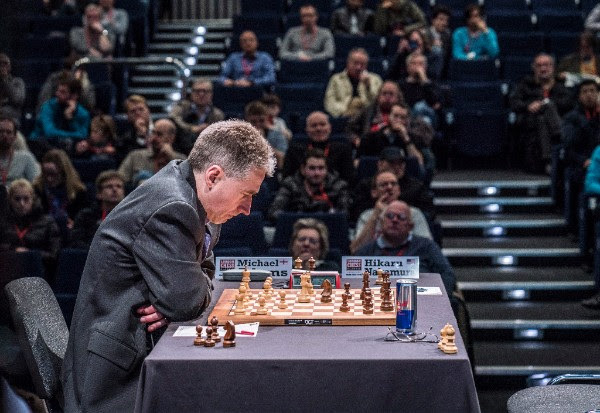 After his second win in a row, Caruana is now leading by a full point. Carlsen achieved a big initiative after the opening and felt like he was winning before time trouble. Once they reached move forty, he felt that much of advantage was gone and he had to start anew. Unfortunately for him, the rook exchange in the opposite color bishop ending that took place during time trouble only helped his opponent’s drawing chances. Carlsen pressed as much as he could, but the position offered enough resources for So to salvage the half a point. Thanks to his stellar defense, So remained unscathed. 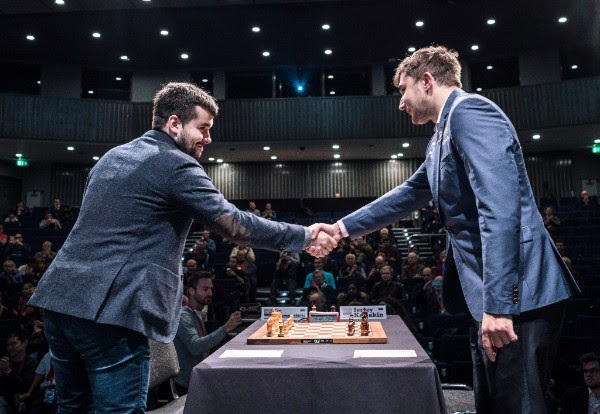 Yesterday, in the postgame interview, Aronian joked that bragging rights against friends need to be earned. Today, he rightfully handed those rights to his opponent. 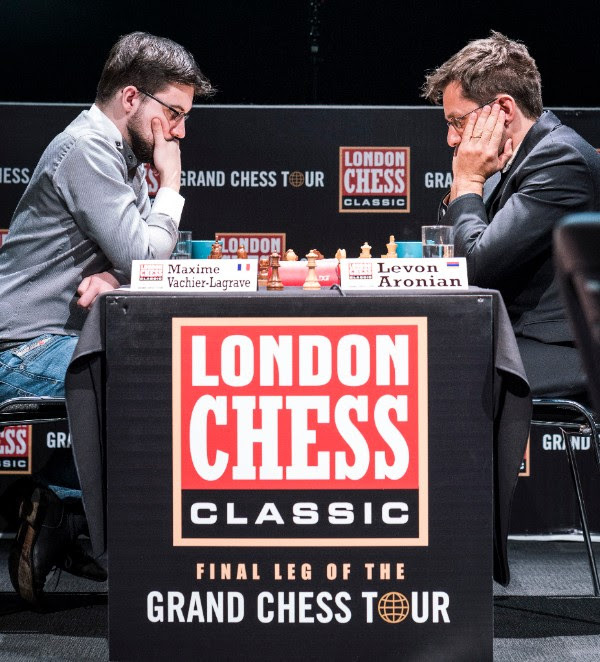 Aronian found himself in a very dangerous position in the middlegame after Vachier-Lagrave played an opening he doesn’t usually play. The Frenchman sacrificed a pawn to keep his opponent’s king in the center, but felt that, even though he had sufficient compensation, the position was unclear due to his lack of development on the queenside. 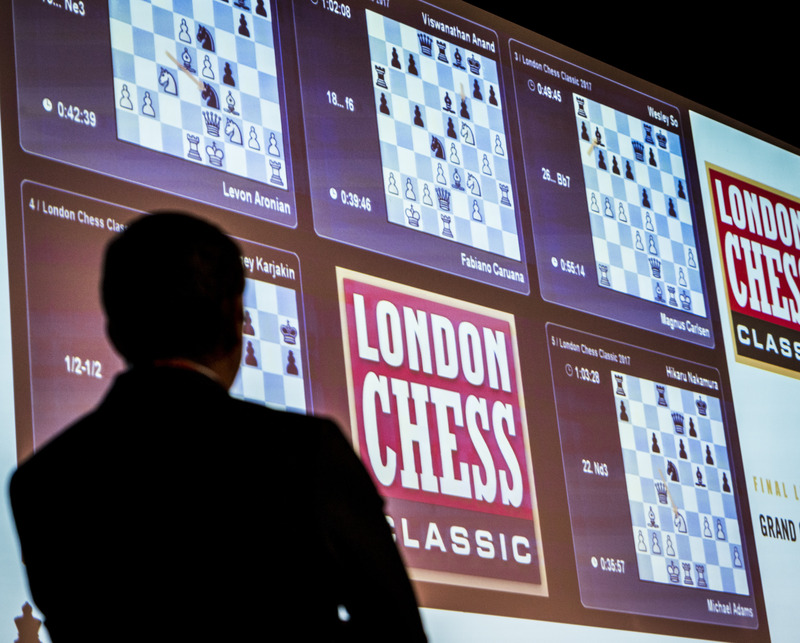 Aronian escaped with a draw when, unable to find a better continuation, his opponent decided to repeat the position. This was another frustrating turn of events for Vachier-Lagrave who could have scored at least one full point in either of the last two games. For the second time in this event, Nakamura opted for one of the most aggressive variations of the Sicilian, the Dragon. Unlike Vachier-Lagrave, who chose the Yugoslav attack against the American in round two, Adams castled on the queenside leading to a more strategic battle. According to Nakamura, his opponent didn’t play the most accurate line and only he could have been better in the game. Adams also felt that his opponent’s king was safer than his which required cautious play. The game ended in a draw on move thirty-two. In Nepomniachtchi’s’ own words, the game was decided on move five. After playing one of the sharpest lines of the Nimzo Indian, Karjakin surprised his compatriot by recapturing on d5 with a pawn instead of the queen, as he had done against Kasparov during the Saint Louis Rapid and Blitz. Nepomniachtci was not proud of his choice of exchanging all the pieces, but being caught completely unprepared, he decided not to enter any theoretical discussions over the board. A draw was agreed on move thirty in an equal rook endgame. 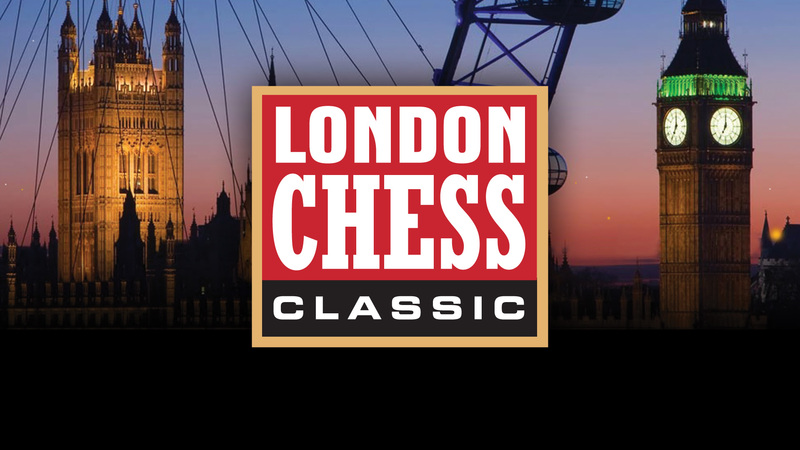 Watch the games of the London Chess Classic 2017 with computer analysis LIVE on ChessBomb. Copyright © 2017 Grand Chess Tour. All rights reserved. It is the mission of the Chess Club and Scholastic Center of Saint Louis, an educational organization, to maintain a formal program of instruction to teach the game of chess and to promote and support its educational program through community outreach and local and national partnerships to increase the awareness of the educational value of chess.